James Stewart plays a habitual criminal who is released after 40 years in jail and wants to claim $25,000 of prison pay that he has banked legitimately. But the bank manager has run off with it, forcing Stewart back to his old ways. The star chews up the scenery, while George Kennedy, Strother Martin and a young Kurt Russell offer expert support. The film's title in the UK was Dynamite Man from Glory Jail. 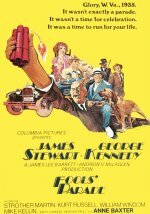 Western starring James Stewart and George Kennedy. When Mattie Appleyard is released from jail, he's determined to go straight. But his plan to open a general store looks set to fail, thanks to the actions of an unscrupulous banker.